Windows 7 became the favorite operating system for the most of Windows users. One of the attractive feature of Windows 7 is it's logon screen itself. But, since it is appears in each time when you power on the system,it might be boring to see the same thing again and again. Many of us think that "It might be better to customize it". But Microsoft had not created an option to do the same inside Windows 7 .These thoughts had led me to create the 3rd updated version of our most popular tool Windows 7 Logon Editor. Since there are a lot of tools named as Windows 7 Logon Editor available on the web,the name of our tool is changed to Windows 7 Logon Animator. 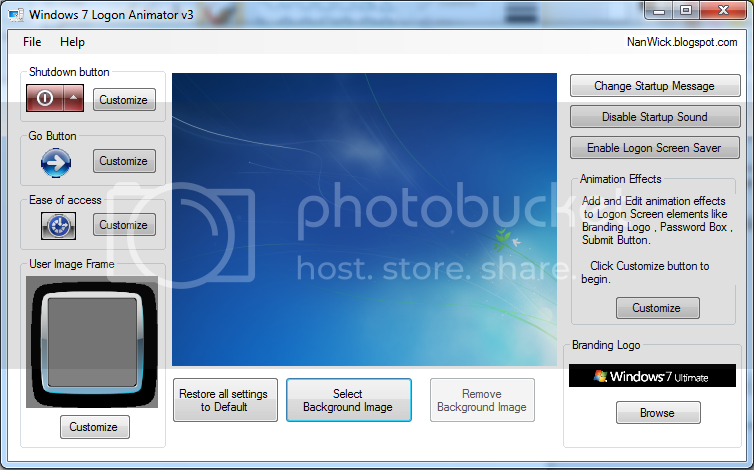 It allows you to enable screen saver at the logon itself. Note : Screen savers which require DirectX could not be used in this method. Set transparency to Go button. Posted by Unknown at 07:37 19 comments so far. What are your thoughts? Recently we discussed about re-enabling old Start Menu in Windows 8. 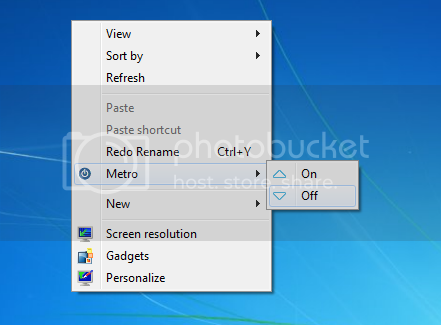 The new start screen, Explorer Ribbon Interface and some other things which make Windows 8 differs from Windows 7 are known as Metro Features. Which helps touch screen users to perform easy and fast. But some of the Windows 8 users still hate these metro features. For this Copy -> Paste following code in notepad and save as Install.reg , Then double click Install.reg. @="cmd /c reg add HKCU\\Software\\Microsoft\\Windows\\CurrentVersion\\Explorer /v RPEnabled /t REG_DWORD /d 1 /f && tskill explorer"
@="cmd /c reg add HKCU\\Software\\Microsoft\\Windows\\CurrentVersion\\Explorer /v RPEnabled /t REG_DWORD /d 0 /f && tskill explorer"
Customize text Metro with your desired text and it's icon by replacing %Windir%\\System32\\shell32.dll,-221 with icon path. Customize text of On/Off buttons by replacing On , Off texts of above code with your desired text and it's icon's by replacing %Windir%\\System32\\shell32.dll,-16749 , %Windir%\\System32\\shell32.dll,-16750 with icon paths respectively. Posted by Unknown at 06:01 7 comments so far. What are your thoughts?